When going to the movies, what's better - the actual movie or all the movie trailers? Or all the stuff in between? Like maybe those Jordan Knight Old Navy commercials. For me, it's a toss-up. But throw in Jeff's strong, pillow-sized arm, the chocolate stashed somewhere in my purse, and the recent James Bond movie... combined with nobody eating popcorn around me... and Molly is all set. But a few weeks ago, a couple movie trailers caught me off-guard. It wasn't so much that they were rough-and-tumble or caca-poopoo-peepee in nature, but that they were those things with the promise of "Christmas." You know how it is with movie trailers, the voiceover guy pipes-in and describes each movie. Well this time, he said things like, "This Christmas... estranged by the only life he knows, a coffin-dragging gunslinger enters a town caught between two feuding factions." Hmmm... guns, blood, coffins. And what are factions? Merry Christmas? And then for the next trailer, "This Christmas... from the ones who brought you Knocked Up and The Hangover, so-and-so (fill in blank with B-actor) finally finds true love." 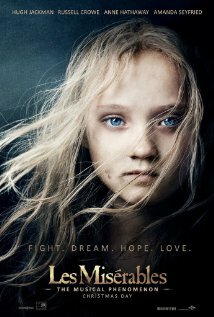 But then the skies parted and a dove flitted-and-floated as sunbeams and waterfalls captivated the whole world, and here entered, before my very eyes... the Les Miserables trailer. More like Les Miser-sob, for I could not get through the trailer without crying. Here's the scoop: You've Hugh Jackman for the ladies. You've got Anne Hathaway for the guys (solely on the basis of her fine acting). And then the movie begins with this amazingly kind Bishop who forgives the sins of a thief, sending him on his way to hopefully make an honest man out of himself. And that's just the beginning. There's so much more to the story: love, redemption, forgiveness, justice, mercy, compassion, hope. And probably British accents. All the things that are at the core of our very soul. You will cry tears, I tell you. Or at least you'll get that old Hollywood misty-eyed glow. Seems to me, humans are super cool. This unique ability we all have to feel deeply is no accident - it's the direct result of being created in the image of God. And I was quickly reminded of my God-created status while just sitting there, watching a two-minute Les Miserables movie trailer. So this Christmas, the voiceover in my mind will not only be joy-to-the-world in nature, but also extremely pitchy as I sing the classic lyrics from Les Miserables: "I dreamed a dream in time gone by - when hope was high and life worth living."